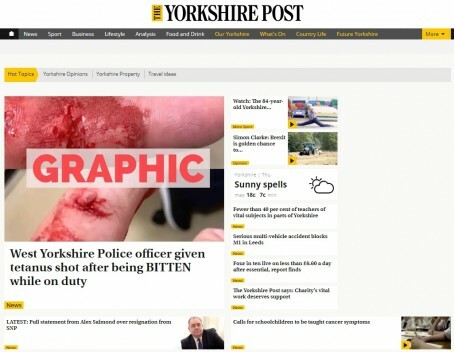 The Yorkshire Post has topped the charts for online growth in the past year, today’s ABC figures have revealed. The Leeds-based Post recorded the best year-on-year change in terms of daily average unique browsers visiting its website, with a figure of 58,654 representing an increase of 43pc compared to its June 2017 recording. The Johnston Press-based daily’s next closest rival from titles submitting figures was the Norwich-based Eastern Daily Press, with 104,896 unique browsers per day representing a 16pc rise. Regional publishers submitting figures were JP and Archant, as well as Newsquest and its now-subsidiary the CN Group. Reach plc, the biggest regional publisher, did not submit figures. The Scotsman recorded the highest number of unique browsers overall, with an average of 138,733 readers visiting the Edinburgh-based title’s site each day. Overall figures were submitted for all Newsquest titles, with a total of 1,618,796 daily average UB representing a 3pc decrease on the June 2017 figure, and all JP titles, with 1,368,212 representing a 2pc increase. Mark Thompson, JP’s head of audience for Northern England, said: “We have seen our strategy of investing in and growing our biggest brands yielding positive results in the most recent ABC figures. The focus is to provide trusted, quality, local content that encourages people to return time after time and rely on the title to keep them informed about the place in which they live. Digital up at the Yorkshire Post, probably explains why the circulation has dropped 10%. Blimey the Norwich Evening Morning News isn’t content with losing even more copy sales and readers in the latest ABC figures,it’s now losing its online audience too! A loss on the digital front such as this one must send a loud message to the board about the worthiness and credibility of this title as surely there’s only so long it can continue to haemorrhage money before the plug is finally pulled or it’s merged with the equally underperforming EDP as one last roll of the dice. This is more a chart showing,from the top,the papers who are better at giving their content away as opposed to attracting paying customers via their newspaper editions all of which are in freefall,but the worrying thing must be that their ad teams cannot monetise their offerings even when claiming % UB growth. It’s no surprise that Newsquest dailies fill most of the bottom places. Their web strategy seems to be obsessed with the wrong things. lets have a comparison of digital incomes. Clicks mean nothing if there is no money attached. Biggest change here is that the number of titles reporting double digit growth has collapsed compared to this time last year (down from nearly 2/3rds in 1st half 2017 to 1/6th 1st half 2018). And the number of sites reporting either stagnant or lower figures has more than doubled to 23 out of 37. Is that just down to Facebook’s algorithm changes? Difficult to be certain without any figures from Reach/TM titles, but doesn’t look good. It pains me to say this as an old school newspaper man, but looking at the shocking copy losses recorded in the latest ABC figures for the country’s local daily papers they might as well scrap the lot, pocket the savings and just go full on digital. The financial implications of losses of this regularity and magnitude in print cannot keep being absorbed by publishing groups who are counting paperclips, reusing envelopes and turning off lights to make ends meet. The number of people buying a local paper is shrinking week by week whilst the figures above confirm more are viewing content on line via social media platforms or the publishers own free to view sites, a worrying trend for the publishing divisions though more encouraging for the commercial teams who should now be able to sell much more site inventory to businesses looking to reach bigger numbers which the papers are no longer able to deliver. However,many digital sales teams are populated by ad reps and managers who are used to selling ‘space on a page’ and who, in my experience,lack belief and real understanding of the medium and who see web advertising as ineffectual and poor value for money. The worrying thing for the bigger groups who have lost their local paper readerships and are celebrating an uplift of online traffic is that no one is making sufficient money from their web offerings to fund their businesses even after many years of trying, and none show any likelihood of doing so any time soon. With newspaper copy sales all but gone, print ad revenues in complete collapse,no one able to monetise digital and no sign of a reversal of fortunes only continuing copy sales losses ,it makes me wonder if we are witnessing the final dying days of many of the once bigger regional paper titles as news print products. It always strikes me as odd when publishers celebrate an increase in the number of people taking their content for free, especially when the very same titles they’re back patting are losing thousands of paying readers each month, carry only heavily discounted advertising and recording all time low ABC copy sales figures.